Tillandsia brachycaulos sporting crimson hues and an elongated form as it nears bloom. Years ago, I had the good fortune to live in Florida for two years. To this northern gardener it was a paradise, where houseplants I had babied in Canada often reached the size of small cars! The heat and humidity nursed a jungle-like profusion of plants. It was there that I was introduced to the genus Tillandsia, commonly called “air plants.” In the south, the most noticeable species of this plant is the luxuriant clusters of Spanish moss hanging from most older trees. When I encountered a flea market vendor selling mounted collections of smaller Tillandsia, I really got hooked. These plants are so decorative and require so little in return. Being epiphytes, they get sustenance from rainwater and air alone and do not have to be grown in soil. I am still growing them since returning to Canada. Here they are houseplants but appreciate being outside for the summer in dappled shade. What are epiphytes? These are plants that grow on other plants or objects, but derive water and nutrients from the atmosphere, not the host. Any roots that exist are for attachment purpose only, not absorption. Tillandsia absorb moisture from the atmosphere through trichomes — modified hairs on the leaves that act as sponges to collect and store moisture for the plant’s use. You can tell quite a bit about your air plant’s preferred growing conditions, by taking a close look at its trichomes, which often appear as a greyish-white patina on the leaves. Air plants typically fall into two classes: mesic or xeric. Mesic Tillandsia hail from tropical forests where the plants get frequent rains and mist. Their trichomes are flatter and less obvious giving the plants a lush green appearance. These Tillandsia require more water and less bright light, like the conditions on the side of a tree in a jungle. Xeric Tillandsia come from dry, desert-like sunnier locations. They have a paler, more greyish appearance owing to the plentiful well-developed trichomes. Some have so many trichomes they appear fluffy. They need the extra trichomes to extract enough moisture from the drier air. These plants require less frequent soaks and brighter light. The author’s collection of air plants mounted with floral wire onto a dried vine ball, then hung in an east-facing window for proper light and airflow. Air plants require indirect light. In full sunlight they will sunburn, so indirect light is key. My plants are wired to a woven vine ball hanging in an east-facing window. This gives them both the light and good airflow that they require, and it is easy for me to move them. For watering, I like to give my air plants a good soak, roughly once a week, for an hour or two. I use a bucket to submerge the whole collection at once. I do the same to my Spanish moss. A key here is to shake out the water afterward and make sure the plants can dry-out fully. This will avoid a common pitfall of the plant rotting from moisture trapped in the centre. Another common mistake is not watering enough, allowing the plant to dry out. Misting, unless done heavily and reliably, often does not satisfy the plant. These plants are low-care, not no care! For fertilizing, occasionally I use wastewater from my fish tank to give my Tillandsias their weekly bath. They respond well to the weak natural source of nitrates from fish waste. I generally don’t worry about fertilizing them otherwise, but I could add a touch of a fertilizer made for bromeliads to their soaking water. The idea here is very low levels of fertilization are needed. Using collected rainwater for their soak provides more nutrients than tap water. It is a good idea to take air plants outside for the summer. The temperature should be well above 10°C before placing them outside. These are warm climate plants! Put them in dappled shade, never in strong sunlight. I hang my plants in the branches of a lilac. The increased humidity in the air and rainwater suits them beautifully, but key here is to monitor them well. Air plants will tell you if they are not getting enough moisture — these plants speak to you, but only in a whisper so pay attention! The leaf edges roll inward like a straw and the tips will brown and die. You may have to look closely to see the roll, on narrower leaves. A desiccated plant can often be revived by an extended, hours-long soaking. T. brachycaulos and T. ionantha both with pups developed. Now as if these beautiful plants didn’t have enough going for them already, they also flower! Flowers vary in appearance depending of the type. Some species (Tillandsia brachycaulos) will even turn a spectacular colour before blooming. Enjoy the blooms and try not to get them wet when watering which will shorten the bloom’s life. 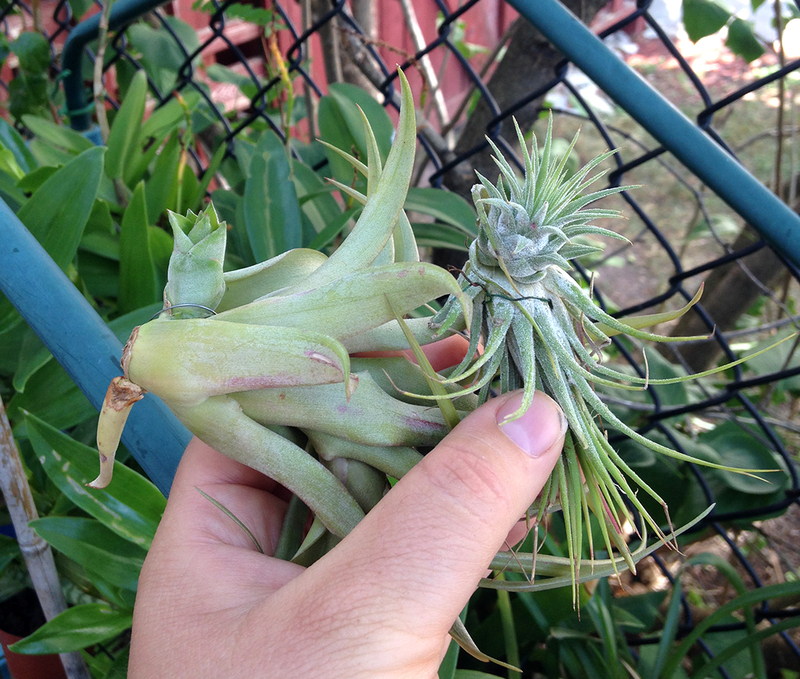 After blooming, Tillandsia will produce offsets or “pups” around the base of the plant. The mother plant will wither and fade away over time or can serve as the centre of a clump if the pups are left attached. 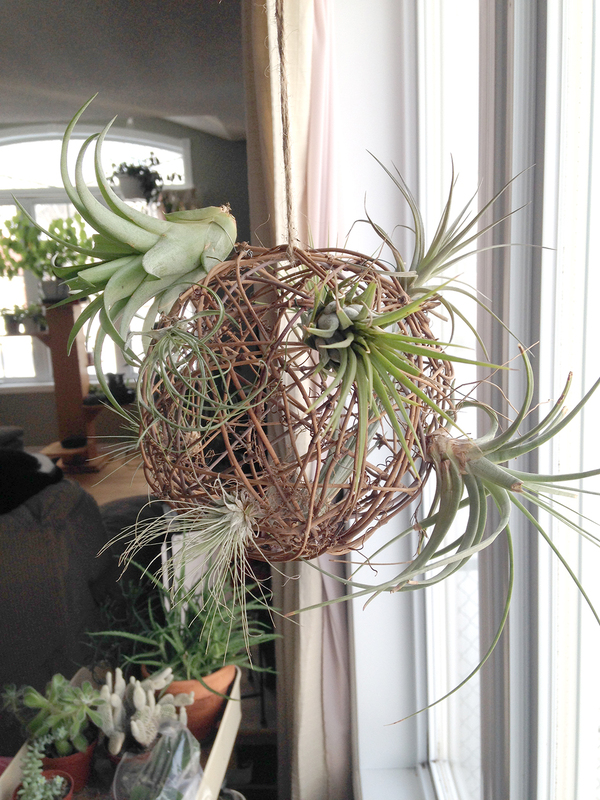 In time, the baby air plants can grow to form a lovely cluster. Alternatively, the pups can be detached when they are about one-third the size of the mother and the cycle starts anew! 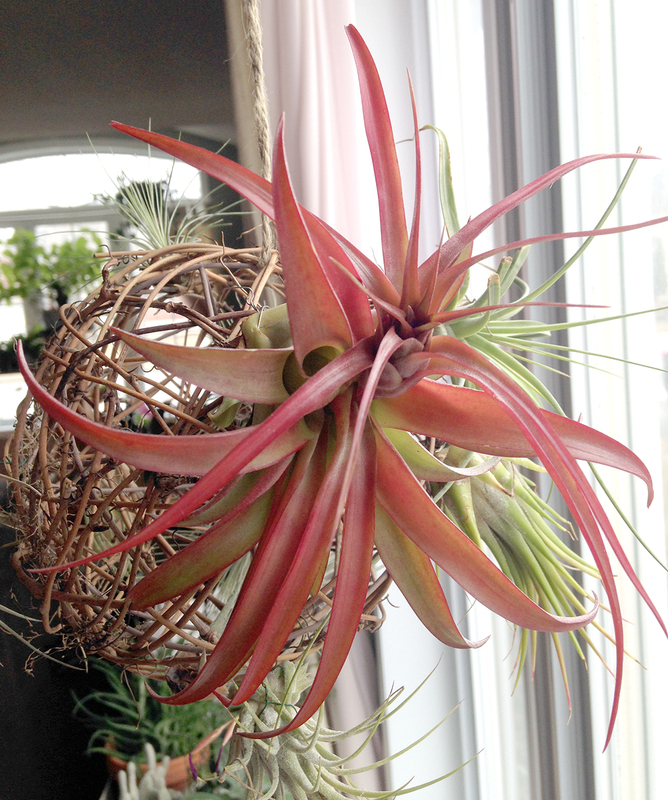 Overall, Tillandsia are low-care and easy houseplants, a beautiful addition to the indoor gardener’s repertoire. These plants have been growing in popularity for good reason. Give them a try! A well-stocked florist or indoor garden centre may have a display of Tillandsia. Look for plump, well-hydrated specimens that are not rotting or drying out. Plants bought in flower are fine. Just be prepared for the parent to weaken as pups develop over time. Online vendors who specialize in air plants will ship to you. Check reviews before ordering to ensure you have a reputable source. Hardware stores occasionally carry some. Check the condition before you buy them. Other gardeners may be willing to trade you pups or plants. 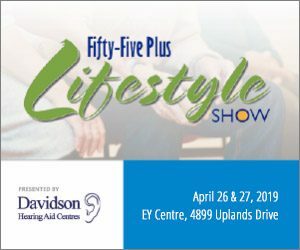 Esther Bryan has been with the Master-Gardeners of Ottawa-Carleton for three years now and loves to grow both weird houseplants and weird vegetables depending on the season.